Retro masterpiece or junk shop curio? 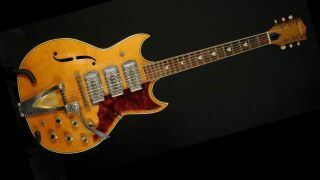 Eastwood Guitars unashamedly rummages through the back catalogues of long departed guitar marques and recreates their finest instruments for a small but ravenous market of well-funded retro enthusiasts. Latest off the production line of their Custom arm is the Airline Swingmaster. Apparently on their customers' radar for a decade, this typically striking semi-hollow maple top guitar will sport 3 P-90 pickups, 5-way switching and individual volume and tone controls. Unless you've already pledged via Eastwood's ingenious preproduction crowdfunding mechanism, the Airline Swingmaster will cost you $949 for the trapeze tail, or $1099 with Bigsby. For more info on this guitar and to have an ogle at some more of Eastwood's idiosyncratic reanimation projects, visit Eastwood Custom.